One of the most delicious ways to enjoy your favorite cuts of meat is via ground meat. Burgers, sausages, meat balls, tacos, and chili are just a few delicious everyday delights that are comprised of ground meat. However, to get the freshness, quality, and flavor right, many at-home cooks prefer to grind their own meat. So, we did the homework for you and found the best meat grinders under 100 dollars for those who want to grind it out at home! Using a meater grind in your kitchen at home can really elevate the flavor of your cooking. Also, it's safer to grind your own meats since you know what exactly went into your ground meat and when it was ground. You want to make sure that you have enough space in your kitchen to accommodate your new-found grinder. If it is a stand-alone electronic grinder, these make take up a lot of counter space. However, if it's a simple attachment, these may be easier to store in smaller kitchens. Most meat grinders come with a manual crank grinder, stand mixer attachment grinder, or as a stand alone electric grinder. Make sure to choose one that fits your kitchen size and needs. If you don't grind meat that often, then you may want to go with a cheaper and smaller manual grinder. 17.2 x 7.9 x 9.8"
For those of you who are looking for an all-in-one meat grinding machine, this is the product for you. This 800W standalone electronic meat grinder fits perfectly on your kitchen counter top and doesn't take up too much space. It also looks pretty schnazzy with it's black and silver modern design. When it comes to grinding, this machine does it all! Wielding 3 different grinding plates, you can get all types of grinds for burgers, meat balls, and more. Plus, the machine includes a sausage making attachment and a kibbe attachment if you want to get a little more adventurous. Overall, the Homeleader Meat Grinder truly lives up to its name, being one of the best products on the market for grinding meat at home. 19.3 x 10.4 x 8.4"
If you're ready to take your meat grinding game to the next level, this is the machine for you. 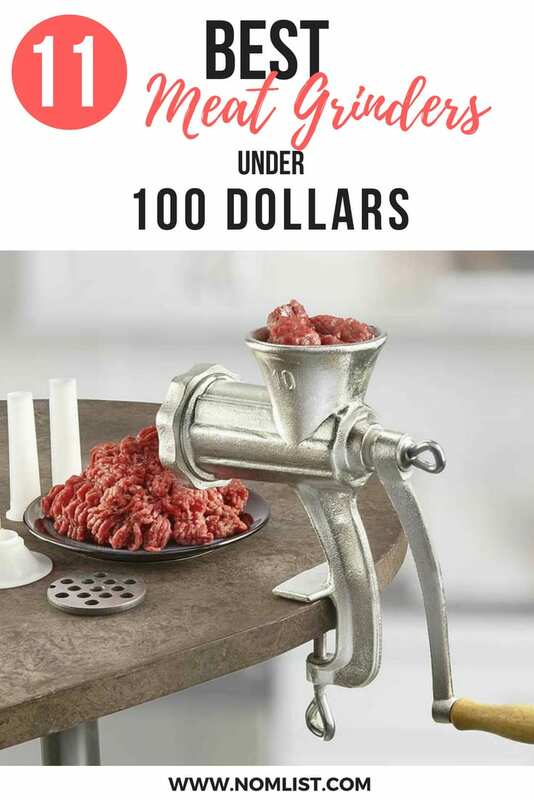 The Sunmile Electric meat grinder and sausage maker makes the perfect grind on your meats for patties, meatballs, and more. This machine is simple, minimalistic, but extremely effective. With up to 150 lbs of meat grinding power per hour, you can truly start grinding meat for a family or even a dinner party. The machine includes three different grinding plates with gives you texture options. Also, the machine comes with a 1 year manufacturer's warranty, guaranteeing you quality. 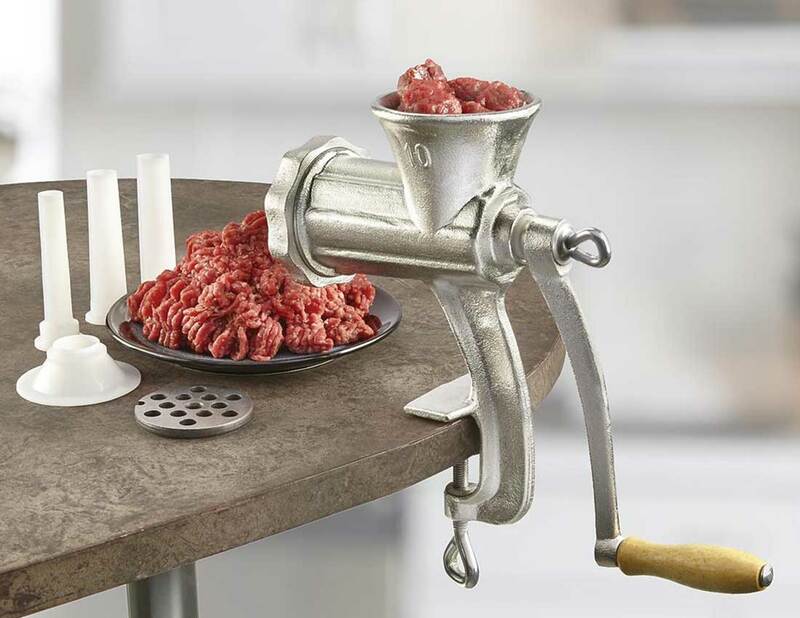 In the end, we love this meat grinder and we believe it's a great starter machine for you and your family. 8.63 x 5.59 x 9.13"
If you have a stand mixer and want to amp up its abilities, you need to get this grinder. Not only does it turn your already existing technology into something awesome, it's also easy to use. Made from premium aluminum, it's light, heavy duty, and easy to use and clean. Not only does this grinder grind meats to perfect consistency, it also grinds cheeses, fruits, and vegetables. Also, the grinder includes one grinding blade and two grinding plates perfect for patties and pates. Plus, it's easy to store since it's just an attachment. By far, this is one of the best bangs for your buck if you have a decent running stand mixer.